#stampinup #faithfulinkspirations #saleabration2017 With yesterday's card, I introduced you to the "Avant Garden" stamp set that you can earn for FREE with a $50 purchase during Sale-a-Bration. That card was bright and pretty in two shades of purple. Today's card is just as pretty, but it uses a more subtle color combination: Crumb Cake, Very Vanilla, and Blushing Bride. I started by stamping the flower from "Avant Garden" in Crumb Cake Ink across a 5-1/4" by 4" Crumb Cake panel. I also added some sprinkles in Crumb Cake Ink from the same set. I wrapped a length of Gold Metallic Ribbon--another SAB item!--around the panel before using Stampin' Dimensionals to adhere it to a Crumb Cake card base. Next, I cut a Lace Doily in half and slipped it under the ribbon, adhering it at the top. I stamped the sentiment in Crumb Cake onto a 1" strip of Very Vanilla and flagged the end with the Banner Triple Punch. I adhered this to the card with Stampin' Dimensionals. 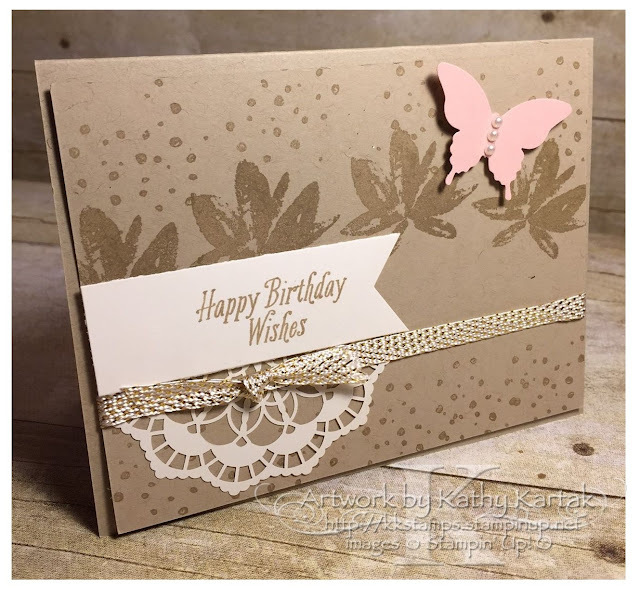 Finally, for a sweet detail, I punched a Blushing Bride butterfly with the Elegant Butterfly Punch and added it to the card with a Stampin' Dimensional. Then, I added a row of small Basic Pearl Embellishments. So sweet! I love the contrast between these two cards--same stamp set, but completely different looks when you use a different color palette and mix up the embellishments.